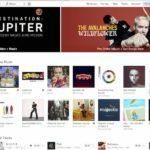 The iTunes interface goes through changes with every new major release. Apple made some nice design changes, but there are others that throw us totally off the track. One of the areas where iFolks have challenges is figuring out just how to download all episodes for Podcast in iTunes. The settings can be a little confusing, and we focus on providing you with some of the easy tips to get you started. Many listeners like to download individual episodes of a podcast into their Macbook or iDevice so that they can listen to the episodes even when they don’t have a wireless or cellular connection. You can download individual episodes of a podcast quickly by clicking on the download button next to the episode. There are times, however, when you subscribe to a new podcast and would like to download all the past episodes of the feed into your computer. 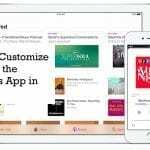 In this article, we walk you through some of the common settings that are made available to you to manage and enjoy podcasts via iTunes. 1.4 Don’t see many episodes? Once you have opened up iTunes, you choose the Podcasts option in the menu selection. If you are just getting started with Podcasts via iTunes, you may or may not see ‘Podcasts’ as a menu option. Make sure that the Podcasts choice is ticked. Click on Done. 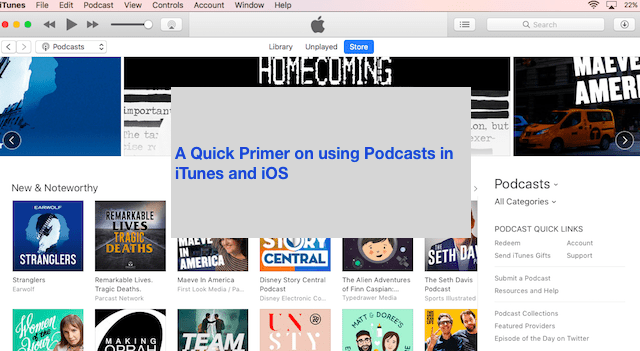 Podcasts will now be available to you in the drop-down for the iTunes menu. On the top, you will find three tabs to choose from Library, Unplayed, and Store. Select Library to see all the podcasts that you subscribed to. Click on any given podcast in the middle column, select Feed, and you see a list of all the episodes available to you for downloading and playing. If your Feed list is not listing many episodes, select the Podcast Settings Menu (blue cog icon) in the upper-right corner. Look in the section “On This Computer” and check that you’re not limiting any episodes from appearing on-screen. If so, set Limit Episodes to Off. And verify that Download Episodes is set ON. 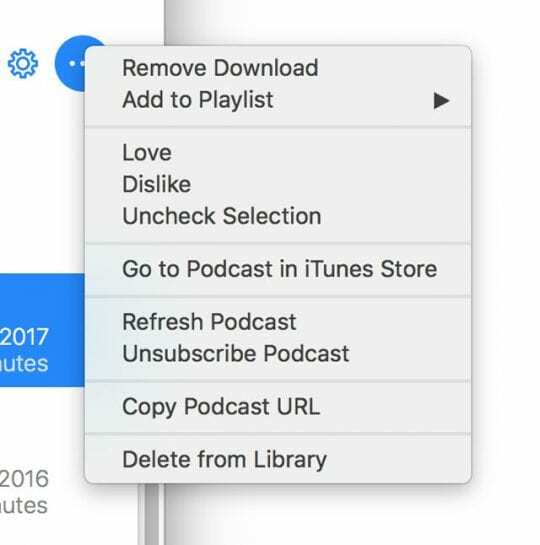 To download all the past episodes of a given podcast, right-click on the podcast’s icon or name in the middle column and select ‘Download All.’ In prior versions of iTunes, this option was available on the ‘List’ tab. 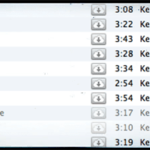 For iTunes 12.5.x, the ‘List’ tab is not available readily. So right-click and choose Download all. This action starts the simultaneous download of all the past episodes of the podcasts into your computer. And that saves you a lot of time, so you don’t have to click on the ‘download from cloud’ button next to every individual episode that you want to download. While the episodes are downloading, pause the downloads if you change your mind. Just click on the download button and scroll down to the end and choose ‘Pause Downloads’ to stop the download. Once all your Podcast’s episodes download, you can sync them with your iDevice. Clicking on your Podcast Settings Menu (blue cog icon) in the right-hand panel customize your podcast options. 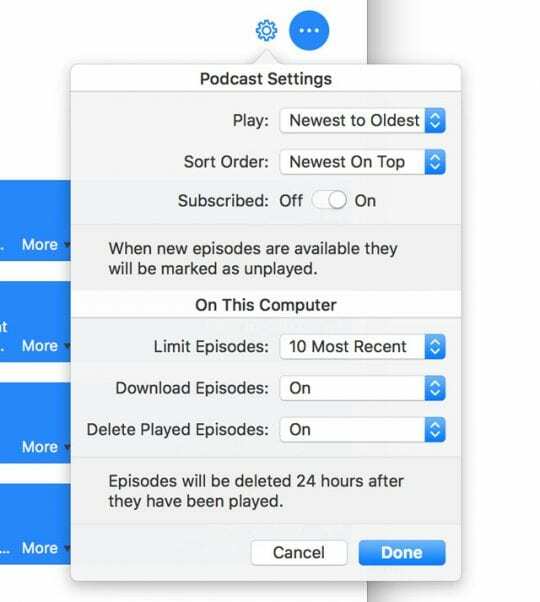 On the top half of this setting screen, you choose the sort order for the episodes, choose whether to play newer or older episodes first and verify the subscription status. This section provides you customization features to control how you want your computer to handle the new podcast episodes. 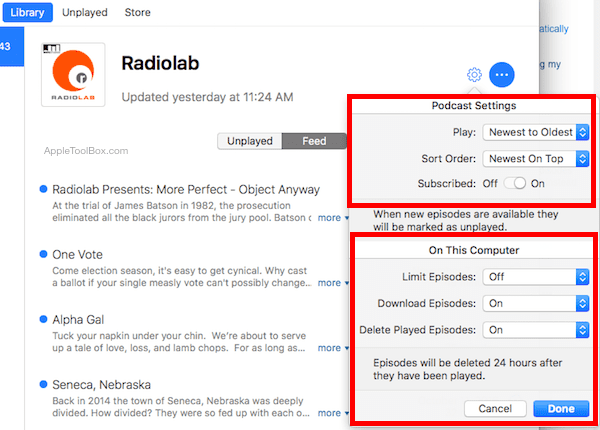 Choose to limit the number of episodes that store on your computer, automatically set to download new episodes when available, and even have your computer automatically delete downloaded episodes once they are played. Change all these options to your taste in this important setting. Some users prefer to not have the automatic download option while others prefer to retain the episodes after they have been played. By using the Podcast Settings Menu (blue cog icon), you control the various settings as described above. Clicking on the three dots button next to the Podcast Settings Menu (blue cog icon) provides you with some additional configuration. Here you provide your feedback rating on the podcast, delete all the downloads for a podcast, unsubscribe from the podcast or remove the podcast from your library among other choices. Check out these setting for all your Podcasts in iTunes. 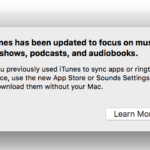 While working with iTunes on your computer, you may sometimes encounter this weird error. This error happens particularly when you are trying to subscribe to a new podcast. When you click on the subscribe button, you see this error, and it does not let you subscribe to any new podcasts. If you are having this issue, the simple way to fix this is to click on Account from the top iTunes menu and choose sign-out. Once you are signed out, sign back in using your credentials and then proceed to subscribe to your new podcasts. Running into iTunes Error 14? 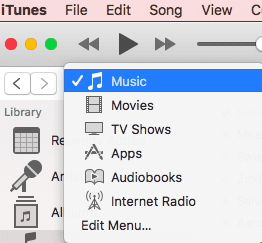 Most of the settings discussed in the prior section focused on using iTunes on your computer to get the best out of podcasts. 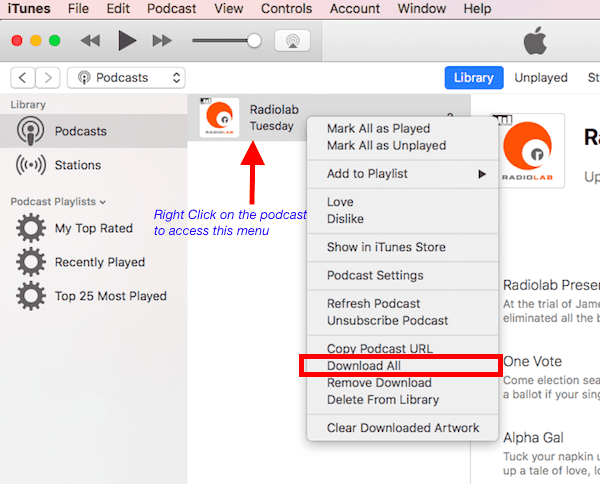 You also control how podcasts operate on your iPhone and iPad. Tap on Settings > Podcasts. 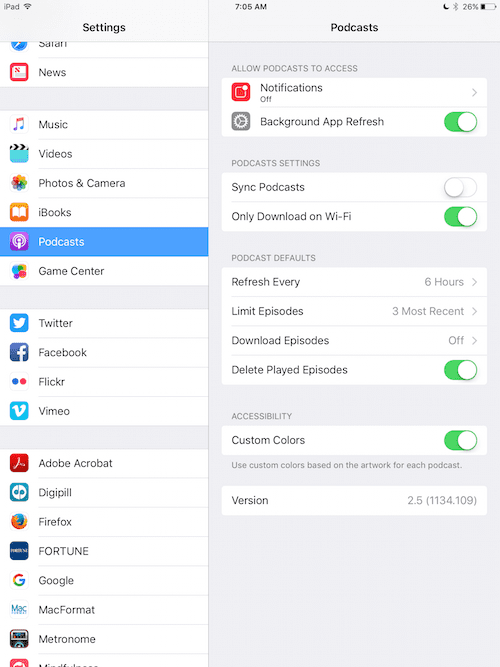 This shows the various podcast settings available to you on iOS. Toggle On ‘Sync Podcasts’ to sync with your computer when you connect your iDevice to your computer running iTunes. We hope you found these tips helpful. 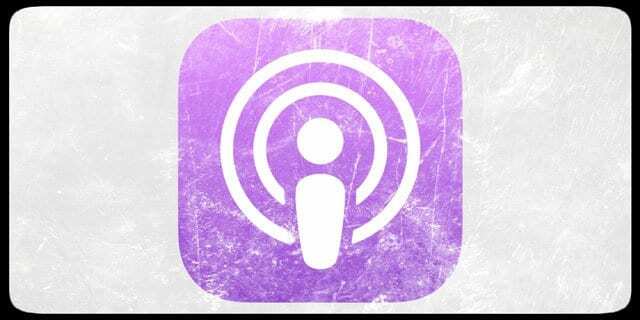 Please let us know some of your favorite tips when it comes to using Podcasts on your idevice. What are some of your favorite third-party apps that you use for Podcasts? hey, I have a good idea to download episodes, wonderfox free hd video converter factory, which can not only download serials, but also convert videos to different formats. Share with U. In the latest version 12.8 for windows 64 bit the trick seems to be to mark all unplayed and the episodes start to download. The steps for downloading all podcasts does NOT work for iTunes 12.7.2.60. The drop down menu displayed with a right mouse click DOES NOT include a ‘download all’ option. Very frustrating. Is it actually possible to download all? I have lost the dates on my podcast episodes. How can I find out WHEN an episode aired originally? Sorry you’re having trouble with iTunes and downloading podcast episodes. 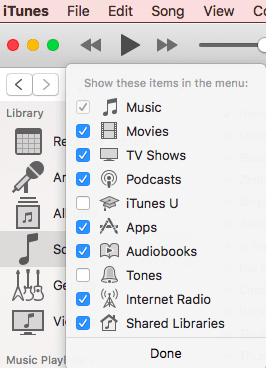 It appears that in iTunes 12.7, Apple once again removed the Download All option from the menu when you right-click on the Podcast name or icon. 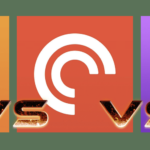 The workaround is to select (highlight) all the episodes you want to download by using either the Command and + keys to select episodes or using the Shift Key to select a continuous list of episodes, then right click and choose Download Episodes. We’ll update the article with these tips for the latest version of iTunes. That is so messed up. What is wrong with Apple?! They are as messed up as Micrsoft! Thanks! I have the version with the bug where “download all” does not show. The workaround was successful. Thanks for letting us know! Awesome it worked. Thank you!!!!! I couldn’t figure out how to download all the episodes of a podcast. And I ended up needing the workaround since my menu didn’t include “download all episodes”. This is not true: “In iTunes 12.5.x and higher, the ‘List’ tab is not available readily. You can right click and choose download all. This will start the simultaneous download of all the past episodes of the podcasts into your computer.” When I right click as directed, there is no Download All item. In iTunes 12.6.0.1 specifically, there’s a known bug on downloading podcasts. For now, another way to download podcasts. Hopefully, this bug is fixed soon!